What is the name of the trailing ship in this image? Black and white postcard of SHENANGO No. 1 leading another steamboat into Fairport, OH through the ice. SHENANGO No. 1 burned while caught in the ice on March 11, 1904. Undivided back. Postally unused. 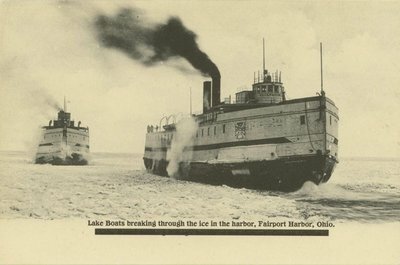 "Lake Boats breaking through the ice in the harbor, Fairport Harbor, Ohio"